Chrichton's World: Review American Ninja 2: The Confrontation (1987): A bit more flawed than the original but still a lot of fun! Review American Ninja 2: The Confrontation (1987): A bit more flawed than the original but still a lot of fun! Most people who have watched this film will claim that this sequel is an improvement on the original American Ninja. For a long time I felt the same but now I don't. The original is superior. Not by much but enough. So why do I think this? Well, the one thing that made the first one very entertaining was the mystery and mysticism. It really made the ninja's, Joe Armstrong and all the events tied to them more compelling. Here they removed that mysticism and turned ninja's into genetically engineered obedient killing machines. They are still very dangerous and lethal but somehow it makes them less interesting. The fact that ninja's are normal human beings who are capable of the impossible is what makes them special. The film also does a poor job of making their point since Armstrong and Curtis Jackson (Steve James) have very little trouble dealing with these super ninja's. It would have been nice if they had more trouble. Still it never gets tiring to see them beat the bad guys. Especially since they are constantly mocked for just being army rangers instead of marines. These marines let themselves get captured or killed so easily while Joe and Curtis manage to dish out a lot of pain and death. American Ninja is filled with a lot of combat that is very entertaining but like the original has a somewhat slower fight choreography. However the ninja's are still awesome and cool and do display some neat skills. One of them is a group of ninja's climbing a rock where they form a human ladder and then have two of them climb this human ladder and pull the others. The main ninja called Tojo Ken played by Mike Stone is impressive but doesn't get that much opportunity to shine as the Black Star Ninja. And that is a shame if you ask me because he deserved better. Another element that makes the action more exciting is George S. Clinton's soundtrack. Right from the start it sets the stone and never lets up. 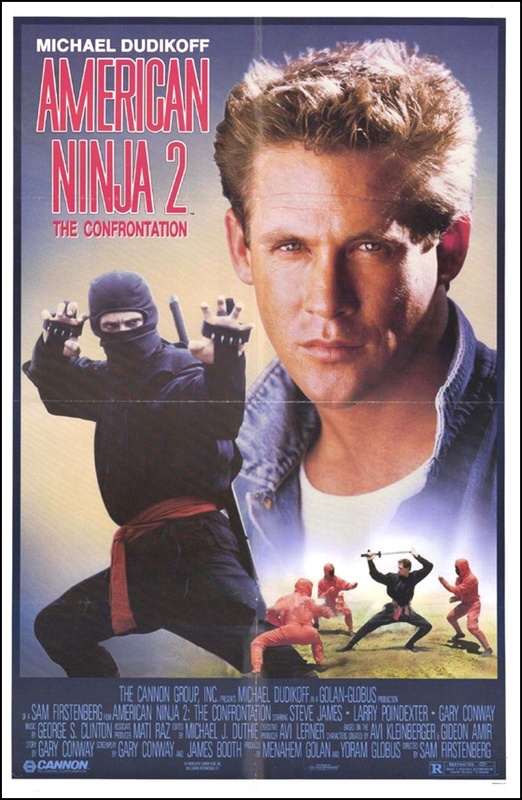 Overall American Ninja 2: The Confrontation is a solid sequel that is a lot of fun. I do think that this is one you can watch repeatedly without getting bored but am not sure if I could call it a classic. I will have to think about it some more.